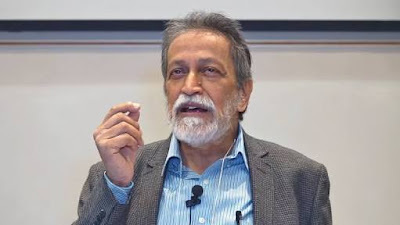 Prof Prabhat Patnaik, one of the topmost Indian economists, has revealed that the Government of India’s Central Statistical Organization (CSO), while announcing 7% gross domestic product (GDP) growth for the third quarter of 2016-17 (October-December 2016), did this by “revising downwards the base upon which this growth-rate is calculated”. Calling it a clear case of “doctoring of statistics on the part of the CSO at the behest of the government”, Patnaik says, this manipulation automatically led to a surprise “jump in the growth rate from 6.2 to 7 percent”, a point noted by no other than Soumya Ghosh, who is the chief economic advisor of the State Bank of India. As both these figures would have meant a 6.2% growth-rate for 2016-17, Prof Patnaik says, finally, on February 28, 2017, “suddenly”, the base was further reduced to Rs 28,30,760 crore, getting the third quarter growth rate of 7 percent for 2016-17! Then, he says, following demonetization the trade channels “paid promptly to the producers through currency notes that had been demonetized.” This led to the producers making “larger tax payments than usual to the government in the form of demonetized currency.” And as the net indirect tax collections “were far larger than usual”, the CSO decided to calculate these as gross value added, “boosting GDP figures significantly”! Concludes Prof Patnaik, “The 7% growth rate for the third quarter of 2016-17 claimed by the government which would come down to 6.2 percent if the base figure is not adjusted, would come down further if the under-representation of the informal sector in GDP estimates is taken note of, and would come down still further if the effect of arbitrarily large net indirect tax collections is additionally taken note of.” In fact, it would have been 2% lower -- around 5%. All that one need to see is the explanation given by TCA Ananth who is far more professional than Prof Patnaik. As the Head of the State Planning Board in Kerala he hardly distinguished himself! PM is destroying everything to make things look good.He is against a good India , manupultses everything in his ignorance and arrogance.Intellect and literacy has no meaning in his tenure but the officials go to any extent to make him happy.Why, is he a monarch ?Even monarchs go by the data ,The Democratic institutions have stooped to this PM and his vagaries destroying each brick of India on which if is built. In last line of your statement you have disclose the reality, sir. It's really surprising how our national leaders can make people fool giving fake data in front of the world to conceal their unplanned decision. But GDP method is changed since 2015. Nothing new. "Targeting a person of Amartya Sen's eminence", eh? Lemme ask you, Dr Patnaik, it is ok for Amartya Sen to call demonetisation "despotic", which is a harsh and personal comment, but it is terrible if Modi merely observes that hard work has got the better of Harvard? Amartya Sen is free to say what he wants, but then so is Modi or anybody. If Sen is open to attacking, he should be open to being counter-attacked. As for GDP numbers, ok, let's agree that the government lied. Let us throw this government out and replace it with....whom? The ramrod straight, absolutely honest Congress? Or CPI(M), which has the credit of transforming the poor economy of West Bengal into a clone of the United States? Or, Bahujan Samaj Party, or AIADMK, or what? An intellectual should not let dogma interfere with objective analysis. Those civil servants who do not manipulate figures are not taken to HAG. They are pushed out. This is bureaucracy rule, CAG and other institutions are post analysis institutions and do not correct anything. PM has most important task of keeping masses out of depression while doing corrective maintenance of society. He will not even know that figures presented are manipulated. Often Ministers to keep their performance figures high sacrifice honest approach. Another intellectual waste. No real value. Wasted my time reading this prof. The ram rod UPA managed better GDP for a better part of their rule at a time when crude prices were at it's highest. The lowest they got were in the last two or three years. At least they had highly rated economists planning it all and not some guy who passed a law degree. And the fact that the government fudged numbers to make them selves look good is a down right low. How people still fancy them is beyond belief. I fully agree with you! Amartya Sent may have won a Nobel prize, but he did nothing for the Indian Economy! well, at least he did not harm the economy. do you find it more interesting to stand in queues all day to deposit old currency, and another day in withdrawing Rs.2500 ? These useless intellectuals are not doing any good to either India or its people. They are spoiling everything just because of personal hate they carry against Modi and BJP. This prof. has spent decades and decades of his life teaching economics, ask him what has been his contribution to India or can he list three things he has done which helped poor or needy to live a more respectable life. These are idiots and should be ignored. 1. A choice between two evils does not make the chosen evil good. 2. Most Indians voted for Modi just because they hoped he was the better evil. Assess dispassionately and you will feel the status of our economic and social health. Yes, base GDP figures were revised, but if such revision was necessarily manipulation ? The writer has not thrown any light on that. Why Amartya Sen can not be attacked ? Because of his 'eminence' ? That is another ridiculous argument. Its not about replacing the Govt. Thats not the question here..if the govt is not to be replaced as yet, do we lose the right to question. However, the fact that u too admit that this Govt has lied is appreciable. This , indeed is the hallmark of this Govt of fake degree holders, Top to bottom. I do not expect them to fare better..
Mr Whoever! !, I wonder where were you all these years??? Never heard about you on any, Why only now? Where were you all these years? Why wont he know. What the troll army of bjp doing? Every other remark of this pm in up election originates from whatsapp intelligetsia(so called). Its pretty evident that he is a keen follower of social media. Media is today aflood with the data and articles about this manipulation. Will modiji take action against his fin min. Firstly NDA left the growth rate at above 10 level. So UPA had same momentum. Secondly Manmohan had very good governance support from NDA ruled states Gujarat Bihar madyapradesh, chatishgarh, jarkand Goa etc. these states growth rate were nearly gdp of 5 & above than other states. I ask Prof Patnaik why it is ok for Amartya Sen to call Modi a "despot", but is wrong for Modi to even say "hard work is better than Harvard". Amartya Sen's harsh and personal words are "intellectual criticism" but Modi's mild riposte is "targeting an eminent person as Amartya Sen". What nonsense! Does anybody have any counter to this? Base year changes in every 5 yrs. It was changed in 2010 by Congress govt to 2005 and now again after 5 yrs to 2010 by Modi govt. to match global trend. This is just one of the lies that Modi himself is propagaring and there are lot more. as per modi and his bhakths harvard has no value, foreign intellectuals has no value, english has no value , animals other than cow has no value. but most of these intelletuals will be living out side india, trying hard to get USA greencard, citizen ship for their kids, propagating fake at work and social life. better instead of institutions we will build ram mandirs , meditate and dream of glorious india which is 10,000 yrs back. If a person of PM stature is trying to propagate lies then imagine what his bhakt jan at grass root level can do. they believe in glorying india by faking, yes harvard cannot help here only hardwork to manipulate will. It is so sad that despite all those pillars of Democracy, we still allow these "jumla Bazi" folks to carry on unabated with their ineffective, incompetent and immoral ways. One thing is very clear, the Bureaucracy and the press are silenced using multiple ways. the only way we save ourselves is to use Social Media effectively and spread the message across to the masses through one-to-one contact, wherever possible. I do both and we could see the results in the recent Rk Nagar elections, where people have given five times more vote to NOTA when compared to the BJP. Thanks to articles like these, they help us to write with more conviction. Senthilvasan : R K nagar elections are indeed an interesting example of the ways of Tamil politics. Of course it was all about ideology and policies not money!! Lol! Hitler is legendary too. what is DATA, all we see is poor people with no jobs.